A normal Danish dinner typically consist of some kind of meat, mostly pork or beef, some potatoes, pasta or rice and maybe some bread. We will not consider ourselves super healthy people however, we do try to work out on a regular basis and combined with good food we believe that we are doing alright. With regards to our eating habits we try to avoid most of all the white and carbs-packed stuff like white bread, potatoes, pasta and rice, and then replace it with food that are rich in protein and full of good nutrients. A typical dinner for us is some kind of fried or grilled meat served together with a delicious salad. And when we are talking about salads it is almost never just a simple lettuce/tomato/cucumber-salad. We always try to experiments with all kinds of salads with different vegetables, fruits and nuts like strawberries, watermelon, avocado and pumpkin seeds just to name a few. You will be able to find many of our salads on this blog – just click on the ‘Salad’ tag or browse the categories. 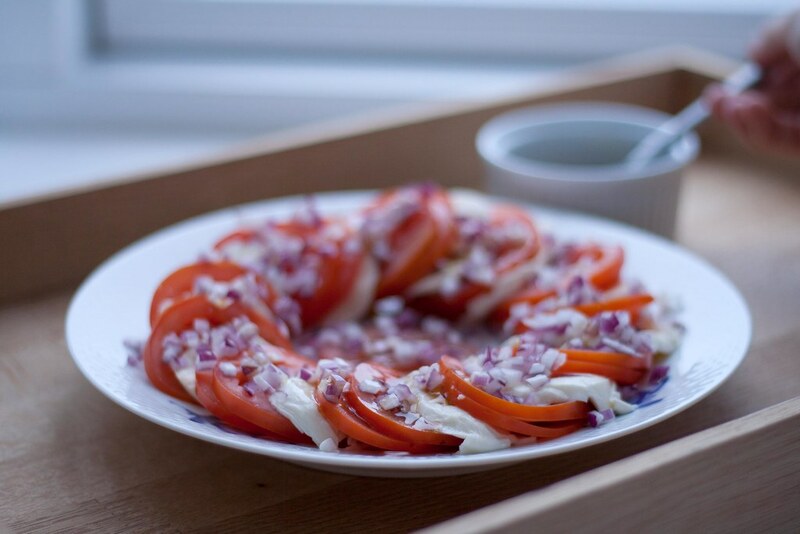 This recipe for a tomato salad with mozzarella and red onions are very simple to make and super delicious. 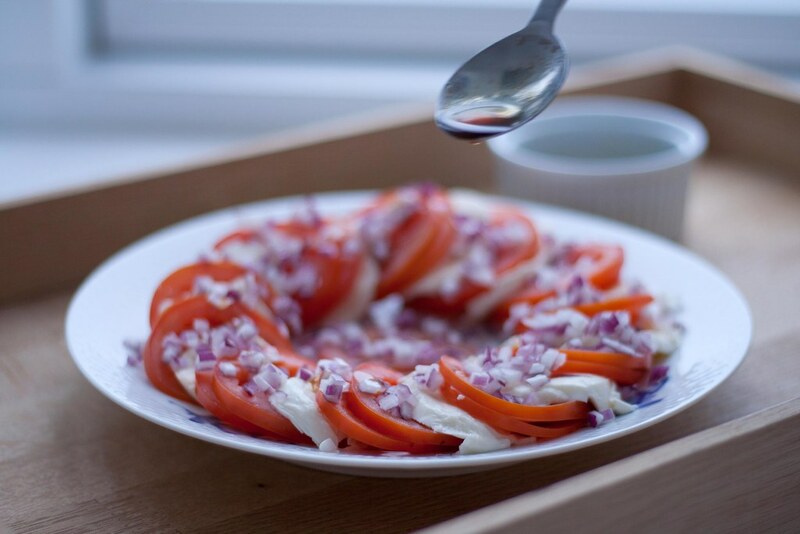 The slices of fresh tomatoes and mozzarella combined with the small and strong tasting pieces of red onion makes this salad our top favorite. It only takes about 10-15 minutes to make and goes perfectly together with most meat like these grilled meatballs. 1. Rinse and clean the tomatoes. 2. Cut the tomatoes and the mozzarella into slices and put them alternately on a dish or a plate (or two tomato slices and one mozzarella slice). 3. 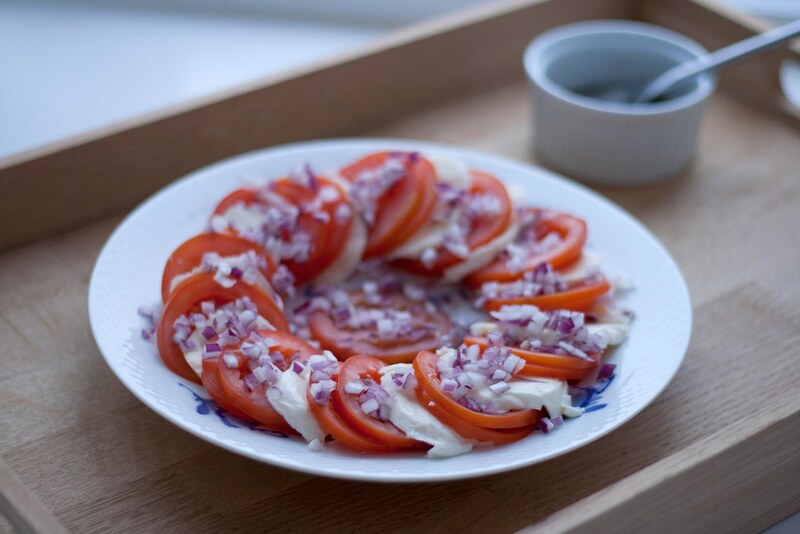 Finely chop the onion and sprinkle them over the tomato and mozzarella. 4. Mix a dressing of balsamic and olive oil and season with salt and pepper. 5. Pour the dressing over the salad before serving. Tip: This salad goes perfectly together with most meat like these grilled meatballs.